IT-manager's Life (English): Corrupted file system ... how to retrieve data from file.CHK? 5 software to repair the damage! Corrupted file system ... how to retrieve data from file.CHK? 5 software to repair the damage! Sometimes, unfortunately, it may happen that the operating system (Windows) is no longer able to read some files. This typically happens because the file system has been damaged because of a problem software and / or hardware. Unfortunately, it is not always possible remedy easily and, depending on the files or folders that have been damaged, it may become impossible booting the operating system! 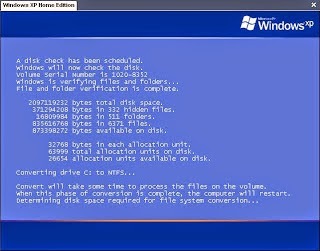 The various versions of Windows (98, XP, VISTA, SEVEN, 8) over time have increased their level of security, and in the meantime the file system has changed (from FAT, FAT32, exFAT to NTFS) and has increased the its robustness to errors. Note (1): HPFS file system is introduced with OS / 2. HPFS is only supported in Windows NT versions 3.1, 3.5 and 3.51. In Windows NT 4.0 is not supported, nor is it allowed to access HPFS partitions. Even today, some computers have storage devices that use File System older and less secure (FAT). More simply, many of us often use USB keys that are usually pre-formatted with FAT32 (not NTFS). If these steps fail to "fix" the file system often creates a hidden folder FOUND.000 that contains all the files or file fragments recovered. They are renamed in the form FILExxxx.CHK, where xxxx is a sequential number. Files with the extension. CHK (Checkpoint) identify precisely lost file fragments and often contain files mixed together so unusable. All these software examine and replace the extension of file.CHK with the most appropriate depending on the nature of the files (photos, documents, music, etc..). In this way it is easier to open and check if they are valid. In some fortunate cases the file is in fact intact and usable! Finally, for those who want to examine the contents of your files manually (e.g. with Notepad) I recommend watching the first few characters of the file and compare them with the legend below to understand the nature of the files examined and associate the correct extension. Supports most fragile and sensitive to problems of file system are USB flash drives and external USB hard drives, especially when using the old FAT system. Often the errors on the file system appear after you have removed the USB stick from your PC without first having "disconnected" with the specific function of Windows system tray, especially when the operating system was still copying or saving data on the stick or still had open files on it. I remember one day in a USB flash drive (FAT32) used with Windows XP, I happened to lose the contents of an entire sub-folder (which showed "strange" characters instead of the name of the file). By inserting the same key on a PC with Windows 7, the OS I was properly warned of the problem and unfortunately "correct" File System automatically transforming however corrupt files on more than 1300 files with. CHK! Thanks to the above mentioned software are quickly able to recover at least a portion of the documents from 1300! Then I used a utility for Low Level Formatting (Low Level Format) to clear the entire contents of the key, and reuse the usb stick, see here: HDD LLF: how to low level format the hard drive. If you use them only as a support for exchange between multiple PCs with different operating systems (XP, VISTA, SEVEN) then you need maximum compatibility then leave it as it is (pre-formatted FAT32). If instead you use to store important data (such as backups) and mostly with 1 PC and 1 single operating system (eg Windows 7) then re-format it immediately into NTFS (New Technology File System), as the latter is more robust to errors. It 's true that NTFS loses compatibility with some older PCs, but there is for them a special reading software (NTFS Reader for Win 95, 98, Me).